During the melting and plasticizing process of the plastic, the melt is continuously moved to the front end of the barrel (measuring chamber), and more and more, gradually forming a pressure to push the screw backward. In order to prevent the screw from retreating too fast, and to ensure that the melt is evenly compacted, it is necessary to provide a reverse pressure to the screw. 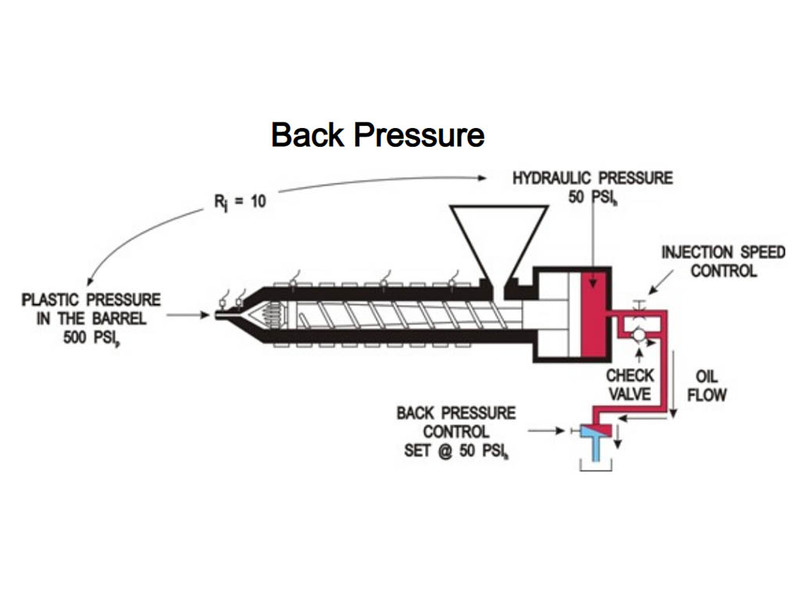 This reverse pressure, which prevents the screw from retreating, is called back pressure. Back pressure, also known as plasticizing pressure, is controlled by adjusting the oil return throttle valve of the injection cylinder. 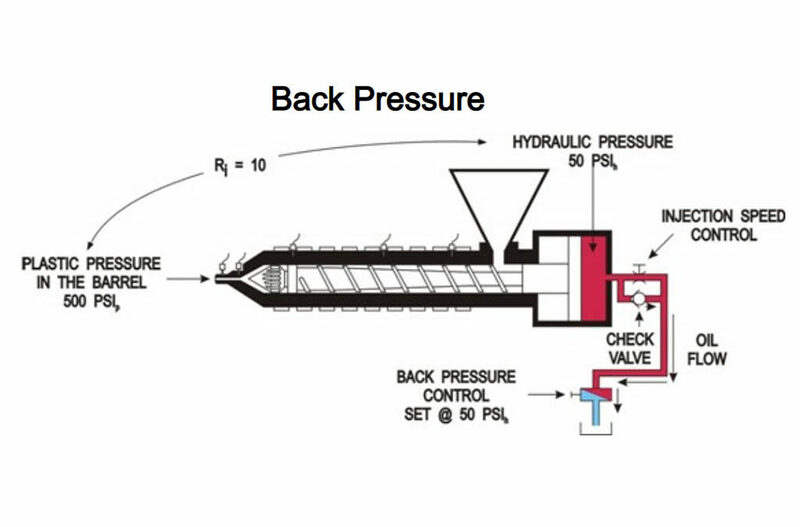 The back of the injection cylinder of the pre-plasticized screw injection molding machine is equipped with a back pressure valve to adjust the speed of the injection cylinder when the screw rotates backward, so that the cylinder maintains a certain pressure (as shown in the figure above); the screw backward speed of the whole motor (Resistance) is controlled by an AC servo valve. The adjustment of the injection back pressure should be based on the properties of the raw materials, the drying conditions, the product structure and the quality conditions. The back pressure is generally adjusted at 3-15kg/cm3. When the surface of the product has air, mixed color, shrinkage, and product size and weight change, the back pressure can be increased. When the nozzle leaks, flows, melts overheating, product discoloration, and screw charge too slowly, consider reducing the back pressure. 1. It can compact the melt in the barrel, increase the density, and improve the stability of the amount of shot and the weight and size of the product. 2. The gas in the melt can be “extruded” to reduce the air bubbles on the surface of the product, internal bubbles, and improve gloss uniformity. Slow down the screw retreat speed, fully plasticize the melt in the barrel, increase the mixing uniformity of the toner, color masterbatch and melt material, and avoid the color mixing phenomenon of the product. 3. Slow down the screw retreat speed, fully plasticize the melt in the barrel, increase the mixing uniformity of the toner, color masterbatch and melt material, and avoid the color mixing phenomenon of the product. 4. appropriate increase of back pressure, can improve the shrinkage of the surface of the product and the rubber around the product. 5. It can raise the temperature of the melt, improve the plasticization quality of the melt, improve the fluidity of the melt during filling, and there is no cold rubber on the surface of the product. 1. When the back pressure is too low, the screw retreats too fast, and the density of the melt flowing into the front end of the barrel is small (relatively loose), and more air is trapped. 2. will lead to poor plasticization quality, unstable injection volume, product weight, product size changes. 3. the surface of the product will appear shrinkage, air flower, cold material, uneven gloss and other undesirable phenomena. 4. the product is prone to bubbles inside, the product around the bone and easy to walk away from the glue. Problem with too high back pressure. 1. The melt pressure at the front end of the barrel is too high, the material temperature is high, the viscosity is decreased, the flow of the melt in the screw groove and the leakage flow between the barrel and the screw gap are increased, which will reduce the plasticizing efficiency (plasticization per unit time). 2. For plastics with poor thermal stability (such as: PVC, POM, etc.) or colorants, the thermal decomposition of the melt due to the increase in temperature of the melt and the increase of the heating time in the cylinder, or the degree of discoloration of the colorant increases, the surface color of the product / Gloss deteriorates. 3. The back pressure is too high, the screw is slowed down, and the pre-plasticizing time is long, which will increase the cycle time, resulting in a decrease in production efficiency. 4. The back pressure is high, the melt pressure is high, and the nozzle is prone to melt the glue after the glue is injected. When the glue is injected next time, the cold material in the nozzle flow channel will block the cold spot in the nozzle or the product. 5. In the process of beer plasticization, the back pressure is often too large, and the nozzle leaks, which wastes the raw materials and causes the heating ring near the nozzle to burn out. 6. The mechanical wear of the pre-plasticizing mechanism and the screw barrel is increased.